Exchange old Irish coins for Sterling today! Collecting old Irish coins is a hobby for some people, but many people would rather skip the hobby and change old Irish coins to receive the cash! You cannot change old Irish coins at a bank even though they once had value. Cash4Coins specialises in sorting your old Irish coins, evaluating the value and turning your unwanted coins and notes into cash. Many people have containers full of old pre-decimal coins that can no longer be used for purchases. People are often surprised to learn how easy it can be to change old Irish coins into usable sterling. So why not change your old Irish coins into cash today instead of letting it go to waste? Many of our customers are surprised at just how much one coin jar can contain and we have had many comments of gratitude from them telling us just what they have spent their money on. You could have old Irish coins from years ago that you thought were worthless, but the good news is that Cash4Coins can make use of them and give you a good price for them too! It takes time to count, sort and value old coins and this is not a job for everybody. Many coin dealers do not offer these services to people that want to exchange old Irish coins. Cash4Coins makes it effortless to change coins from any country. Your leftover coins can take on a new life again by exchanging them for cash. All coins that are sent in are processed and a value is emailed for your acceptance. You are under no obligation to accept our valuation and if you decide that you don’t want to sell, we will simply send back your coins totally FREE of charge. You can’t say fairer than that! If you accept the offer to change old Irish coins, the money will be deposited into your bank account. This fast and accurate service takes the guesswork out of the potential value of old coins and produces funds that can be used immediately. Even old 50 pence pieces from the UK or Ireland will be exchanged. £5 coins, £2 coins, 20 pence coins, 10 pence coins, two shilling coins, 5 pence coins, 1 shilling coins, in fact all old Irish or UK coins and notes can be exchanged. 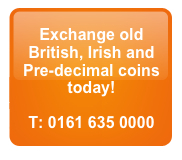 We change old Irish coins and we change old British coins as well as many other currencies. Why not have a hunt around the house to see what treasures you have locked away. That old jar of coins that you thought was totally worthless may take on a new appeal thanks to our service. At Cash4Coins we offer a service that your bank cannot. Banks won’t consider changing old Irish coins so it makes perfect sense to come to us instead. Our customers return to us time and time again before we offer great rates and excellent service. If you have over 5kg of coins then we’ll even collect for FREE. See our page ‘How to send us coins‘ for more info.